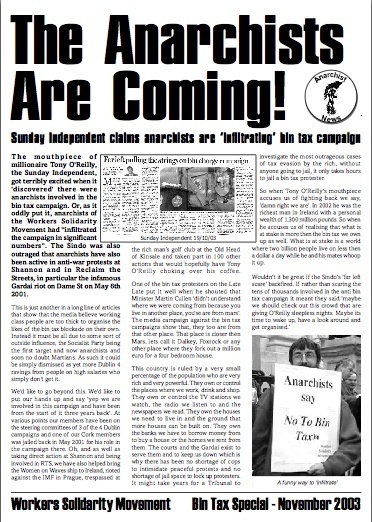 Anarchist News was an irregular bulletin published by the Workers Solidarity Movement, between issues of Workers Solidarity, in the 1990s and early 2000s. This issue was a reply to the Sunday Independent when it claimed that the WSM was “infiltrating” the campaign against the bin tax. In fact the WSM had helped to form that campaign and the secretary for Dublin City was one of its members. As the campaign against the new household tax – which includes the WSM and other anarchists among its organisers – is getting huge support, will we see a repeat of these ‘red scare’ tactics in 2012?